Mississauga might be tough to spell, but it is an easy place to live in! With everything that this city has to offer, it is no wonder that more and more people are calling it home. Finding the best way to take care of your Mississauga property can involve a lot of trial and error – but it doesn’t have to. 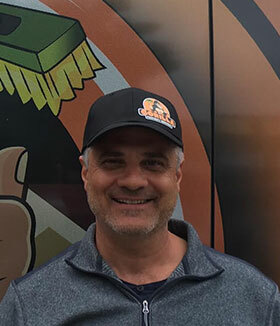 The reach of our Gorillas is always expanding and now, franchisee partner Umberto is calling the shots in the Mississauga area. Umberto is one of many franchisee partners across Canada, that is committed to keeping clients happy and communities clean. This is a broad idea but our team of property experts can carry out services on your roof, yard and even on glass. Clearing debris from your roof or gutters requires technique and skill. When you are noticing build-up, moss growth or slow-draining water, it is time to call a Gorilla. Our window cleaning and gutter cleaning can keep your roof in good condition through semi-annual servicing. Treating your property from the top down involves windows as well. Instead of passing by panes, have Umberto and his team treat windows up to four storeys with our window cleaning service. During the summer and fall months, you can expect expert results for your Mississauga graffiti removal and pressure washing. When winter rolls around, you can count on our Gorillas for your Mississauga snow removal and salting services. No matter the time of year, our Gorillas can help give you peace of mind about your property.